For many students attending the Hiawatha Leadership Academy (HLA) in the Morris Park neighborhood of south Minneapolis, the school day is a fundamental source of food and nutritional education. HLA Morris Park is one of 17 Twin Cities schools currently participating in Second Harvest Heartland’s Food + You program, which helps connect students and their families with healthy food. Food + You’s role at HLA Morris Park includes a comprehensive meal program, a well-stocked food shelf for student use, and family education on the Supplemental Nutrition Assistance Program (SNAP, formerly food stamps). Despite the success of these programs, many students still face the possibility of an empty fridge at home. HLA Morris Park aims to alleviate this meal gap by linking more families to SNAP information. 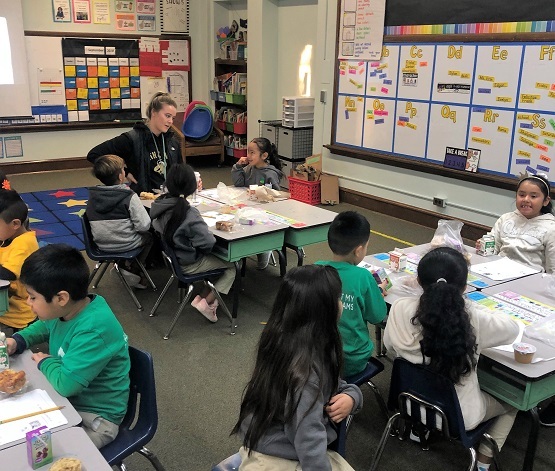 At HLA Morris Park, where nearly 80 percent of the students receive free or reduced-price lunch, federal nutrition programs bolster classrooms with breakfast served daily during homeroom. As early as kindergarten, students learn the nutritional elements of a healthy meal, as well as how to correctly recycle and dispose of trash. The school also maintains a robust food shelf where students can collect food items to bring home for family meals. Social worker Amelia Hook was introduced to the Food + You program when she began work with HLA Morris Park this school year. Although she was impressed with the meal program and food shelf, she felt that many SNAP-eligible families in the community had not yet been reached. “Our families at HLA Morris Park are able to access our food shelf on an ongoing basis, but SNAP can provide them with a sustainable resource to feed their family when accessing the food shelf is not possible [on holiday breaks and weekends],” Hook said. Schools are a natural forefront for SNAP education. Many parents and guardians learn about SNAP benefits and eligibility during their child’s school enrollment or at an orientation event. However, schools like HLA Morris Park are developing new methods of reaching families who could benefit from SNAP enrollment. This year, HLA Morris Park is working to make SNAP enrollment easier by adding referral paperwork to existing contact points between teachers and families. Teachers are adding referral forms to their students’ take-home folders to help SNAP information reach more families and to simplify the process of enrollment. "The standardized SNAP referral process was so easy for me as a new teacher! It was no problem for me to send home the referrals in my student's homework folders,” said Elise, a kindergarten teacher. “It is great to see that my students are getting the resources they need." So far, this new approach is yielding promising numbers. HLA Morris Park generated a total of 43 SNAP referrals throughout the entire 2017-2018 academic year. Just weeks into the new school year, they’ve already collected over 40 referrals. HLA Morris Park is just one of many schools in the Twin Cities to adopt a more proactive approach to SNAP referrals. Hiawatha Collegiate High School (HCHS), a secondary school in the Hiawatha Academies network, promotes SNAP referral during parent-teacher conferences by screening families for food insecurity and providing SNAP information in other languages. A similar method is utilized in South St. Paul’s elementary schools, where teachers are required to identically screen every family. The South St. Paul district observed an 81 percent increase in referrals compared to the beginning of the school year, and HCHS reported a 21 percent increase in SNAP referrals among immigrant families. SNAP is vastly underutilized in Minnesota and nationwide. Second Harvest Heartland emphasizes SNAP education to help more people learn about their options for assistance, and our Food + You program specifically aims to improve SNAP outreach in schools.